Although plastics are now part of everyday life, about one-third of the plastic we use is purposely designed to be disposable, and single-use plastics, like water bottles and plastic bags, are generally used only once before they are thrown away. Preliminary data shows that the students collected almost 12,000 plastic bags over a four-week period. The study group estimated that approximately 145,000 disposable plastic bags are used each month, by families at just these six schools alone! “The data collected by participating schools on Abaco, Eleuthera, Grand Bahama, and New Providence reveal that families average 60 bags per month. A substantial number, if we consider usage by the entire population of The Bahamas,” said Casuarina McKinney- Lambert, Executive Director, BREEF. Plastic is forever. Every piece of plastic ever made still exists today. Unlike organic materials, which can be broken down naturally through the action of microbes, plastics, through a process known as photo degradation can only be reduced to micro plastics which remain in the environment. In The Bahamas, most of our plastics are discarded in landfills, where their bi-products can leak into the soil and water table, attract pests and can pose a health risk for communities. A significant quantity of plastic also ends up in the sea, impacting marine life through entanglement and being mistakenly consumed as food. Fish eating plastic in the ocean is a way in which harmful chemicals can enter the human diet. Students are imploring the public to trade in their plastic bags for re-usable bags when shopping. BREEF’s newest re-usable bags feature the artwork of Shelby Sawyer with the slogan ‘Choose to Re-Use’ by Grace Swing. 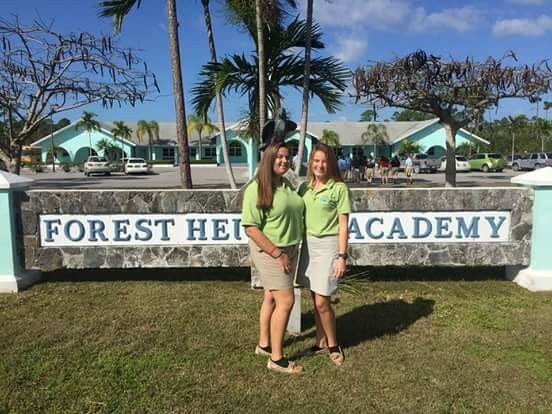 Both are grade 11 students of the Forest Heights Academy in Abaco, and winners of the BREEF Eco-Schools Design-A-Bag competition. This semester, the project’s teams will continue to collect data, with a twist. “BREEF has given 5 re-usable shopping bags to each participating student. They will encourage their families to shop with the bags and collect data to determine how this impacts plastic bag use,” says McKinney-Lambert. The Bahamas is an island nation, so our people depend on healthy oceans for food and to make a living. The plastic bag problem can be addressed and you can make a positive impact by choosing to re-use. For starters, how about taking a few re-usable bags with you whenever you shop? The Eco-Schools programme is an international awards scheme which recognizes schools that make a commitment to continuously improve their environmental practice. The Bahamas programme is operated by BREEF, with the support of the Ministry of Tourism, and includes a network of over 20 registered public and private schools. To purchase re-usable shopping bag(s) please contact BREEF at 327-9000, or email us at breef@breef.org. You can show support to BREEF by becoming a volunteer, donating to our educational programmes or by participating in an upcoming BREEF event. For more information visit our website: www.breef.org, like us on Facebook: B.R.E.E.F., follow us on Instagram and Twitter: breef242 or subscribe to our YouTube Channel: bahamasreef. Newer PostOver 440 Eco-Schools from 38 different countries twinned! Older PostEco-Schools Northern Ireland visit Eco-Schools Kenya!